With U19.2 we now have the ability to upgrade our crafted essences from U18. It is a multi-step process that relies on some random number generated (RNG) drops and RNG crits. NOTE 1: It does not matter which profession crafts the Wild Essence, the end result will be the same. NOTE 2: It does not matter which Wild Essence you craft, the end result will be the same. The end result of crafting any of the Wild Essences from Table 2 is a Wild Essence of Ithilien. You now take this Wild Essence of Ithilien to the Herb-Master in Henneth Annun (48.3S, 7.1W). 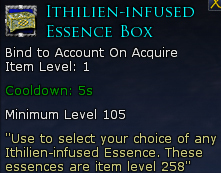 You can barter the Wild Essence of Ithilien for an Ithilien-Infused Essence Box (Bind on Acquire). Note: The above choice will appear in your inventory and is Bind on Acquire. Note: As of Dec 22 SSG has announced that the “RNG crit” rate will be increased and a guaranteed method of receiving gold will be introduced in the New Year. SEE HERE.